The TVA Watts Bar Nuclear Plant is seen Thursday, Oct. 22, 2015, near Spring City, Tenn., as Unit 2 begins producing electricity for the first time, 43 years after construction began at the site. America's first new nuclear power plant to be added to the grid in the 21st century shut down this week for the second time in three weeks, shortly after the unit reached its highest power output so far on Monday. While the Watts Bar Unit 2 reactor was generating more than 390 megawatts — one third of its rated power — the unit experienced problems in its auxiliary feedwater system, which automatically tripped the reactor. 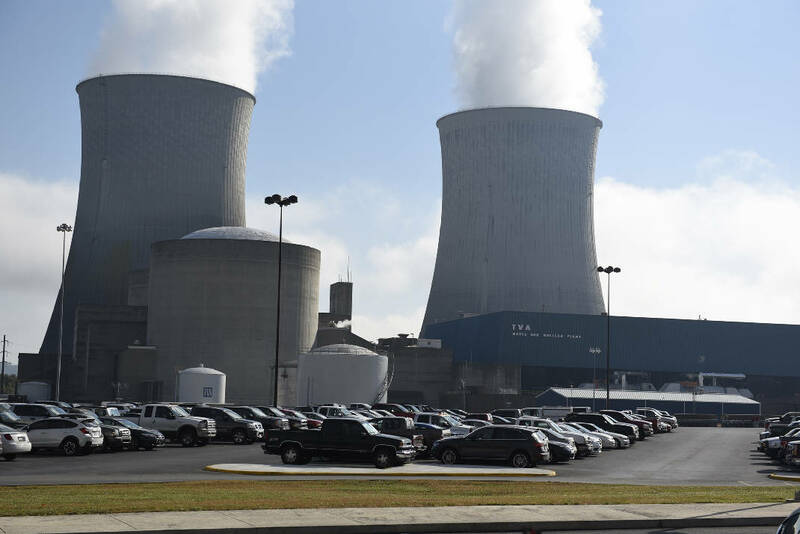 TVA spokesman Jim Hopson said Tuesday the equipment performed as designed and the utility expects to have Watts Bar Unit 2 back online by the end of the week and at full power as a commercial nuclear unit later this summer. The addition of a second reactor at Watts Bar is the seventh nuclear unit for TVA and the first new nuclear reactor in the United States since TVA started the sister unit at Watts Bar in 1996. The addition of another unit at Watts Bar will help replace some of the power generated by the 18 aging coal units TVA shut down or plans to soon shutter across its seven-state region. TVA also has added more natural gas-fired generation to capitalize on cheaper gas prices. Despite the closing of coal-fired units at Widows Creek and Colbert in Alabama during the past year, TVA officials said they expect to easily meet this summer's power demand. As summer arrived this week, temperatures are already hitting the 90s, pushing up power demand as air conditioners worked to keep homes and offices cool. But TVA doesn't expect power usage this week to exceed the peak demand of 28,947 megawatts reached last Thursday when temperatures were in the upper 90s in parts of the TVA region. Such peaks this summer are well below the 33,499-megawatt peak TVA reached in 2007 prior to the Great Recession and the subsequent move toward more energy conservation and efficiency. Electric power usage is falling as most households and businesses switch to more energy efficient lights, appliances and motors. Last year for the first time in its 83-year history, the Tennessee Valley Authority delivered less electricity to the average household than in the previous year. "We are seeing something that we have not seen before, which is a decline in per capita usage — mostly due to organic efficiencies," TVA President Bill Johnson said earlier this year. "We don't know if we are going to ever see that 2007 peak again or not. We have a record number of customers we serve today, but on a per capita basis, usage is declining." A decade ago, TVA forecast load growth of nearly 4 percent a year, requiring TVA to add an extra coal or natural gas unit every year or another nuclear reactor every two or three years. But power demand ended up falling during the 2008-2010 recession and has not fully bounced back yet. In TVA's most recent Integrated Resource Plan largely written two years ago, TVA predicted annual growth of nearly 1 percent and once again those projections have been lowered. In response to slowing growth in power usage, TVA delayed construction on some of its nuclear power plants, including Watts Bar Unit 2. But the reactor ended up taking even longer than TVA wanted when other problems developed during construction. The $4.7 billion unit was initially started 43 years ago. TVA spokesman Scott Brooks said despite the delay in starting up Watts Bar 2 and the shut down of numerous coal plants, "TVA is well positioned to meet any demand. "We still have the ability to produce roughly 33,000 megawatts of our own generation and have contracts for purchasing up to 5,000 megawatts of additional power from surrounding utilities, on an as-needed basis," he said. Brooks said consumers can help reduce their bills and help TVA meet peak demands by reducing their consumption using tips and reviewing their usage with tools found at www.energyright.com. This story was updated June 21 at 10:30 p.m. with more information.